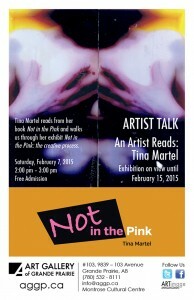 Not in the Pink is a book everyone should read, but hopefully never have to experience what author Tina Martel went through to write it. I laughed, I cried, I was in constant awe of how she could retain her sense of self during all the procedures that she went through. Tina has chosen to not sugar coat or gloss over the horror of cancer treatments. She faces it head on, tells it like it is – ugly truth and all – and absolutely refuses to be beaten by any of it. I commend her ability to go head to head with the medical profession and make her own decisions; I only wish there were more like her. Those medical practitioners need to realize they are working with human beings, not lab rats, and that each human being must be treated with respect. Tina has given us a lesson in life I will never forget and that is that I’m one of the lucky ones (so far). I will now join with all the others in praying to whatever deity I can drum up that she never has to go through this again. Tina, you’ve done us all a big favor by telling us the hard realities and letting us know that no one on the planet has the right to say “I know how you feel,” unless that someone has experienced the same thing. Tina’s artistry comes out on every page; as emotionally stirring as her writing. This is one very special book indeed. This entry was posted in Book Reviews on May 1, 2015 by Tina Martel. 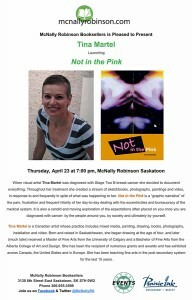 The book launch of Not in the Pink is at McNallyRobinson booksellers in Saskatoon on Thursday, April 23, 2015 at 7:00p.m. I will be both reading and signing that evening. If you live in Saskatoon, know someone in Saskatoon or have even heard of Saskatoon please spread the word! This entry was posted in Events on April 19, 2015 by Tina Martel. This entry was posted in Book Reviews on April 5, 2015 by Tina Martel.